Sam Glucksberg’s research spans five decades, during which he has made seminal contributions to many areas of psychology. He had influenced, among others, the study of problem solving, thinking, categorization, psychology of language and communication in children and adults. Most recently, he has pioneered the experimental study of figurative language, focusing on metaphors, idioms, sarcasm and irony. Dr. Glucksberg’s research is a model of scientific excellence, combining uncompromising skepticism allowing no sacred assumptions, methodological rigor, an emphasis on the big questions, and of course his personal signature- a healthy sense of humor. Sam Glucksberg was born in Montreal, Canada in 1933 and emigrated to New York in 1945. He received a Bachelor of Science degree from the City College of New York in 1956, and his PhD from New York University in 1960. After a brief stint on active military duty at the US Army Human Engineering Laboratories, he joined the faculty at Princeton University in 1963, where he has spent the rest of his academic career. 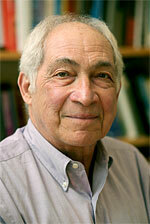 Sam Glucksberg is one of the forefathers of the field of Psycholinguistics. He co-authored one of the first books on experimental psycholinguistics in 1975, and he published 5 editions of an introductory text, Psychology (1981-1990) which he co-authored with Darley, Kamin, and Kinchla. In 2001, he wrote Understanding Figurative Language: From metaphors to idiom. He has served as editor of the Journal of Experimental Psychology: General, and of Psychological Science, as well as being on the editorial boards of numerous other journals. Most happily, he now lives again in New York City as well as Princeton with his wife, Kay Deaux. Catrinel Haught, Spark Management, L.P.
* The FABBS Foundation would like to thank Dr. Boaz Keysar and Dr. Susan Fiske for nominating Dr. Glucksberg for this honor and for leading the effort to spread the word about his nomination. Would you like to honor Dr. Glucksberg? It’s not too late to have your name added to the list of donors! You can make your donation to Dr. Glucksberg’s In Honor Of… campaign at anytime.